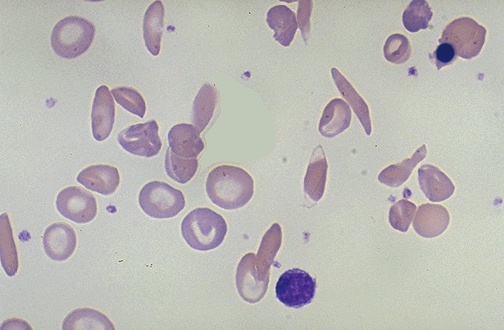 The abnormal hemoglobin SS is prone to form tactoids with crystallization in the RBC's when oxygen tension is low, and the RBC's change shape to long, thin sickle cells that are "sticky" and sludge in capillaries, further decreasing blood flow and oxygen tension. The sickled RBCs tend to adhere to endothelium, and the bioavailability of endothelial nitric oxide is reduced as well, further promoting vaso-occlusion. Persons with sickle cell trait (Hemoglobin AS) are much less likely to have this sickling phenomenon.